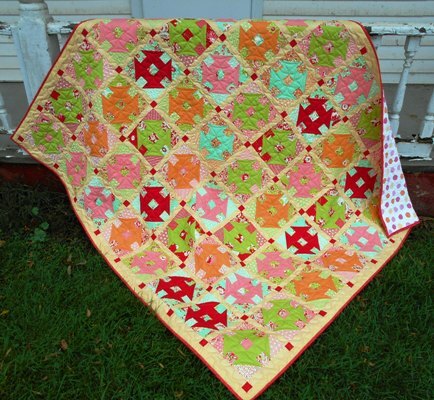 Kelli and and I have a quilt that will be coming out in a couple months in Quilty magazine. That quilt was sewn and sent off to meet a September 1st deadline. 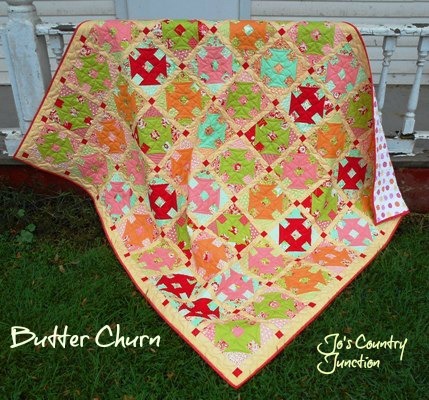 After making the quilt, I was left with lots of great bonus triangles and left over fabric…so much that I was able to put together this quilt that I’m calling Butter Churn. It is made with the bonus triangle and put into Churn Dash blocks. We had asked readers for some suggestions on how to set the blocks (most advice was for a white sashing) We went against any advice given and found this wonderful yellow check fabric in my stash. The funny thing?? There is no yellow at all in the fabric line yet it works nicely. The fabric is a Moda line called Scrumptious by Bonnie and Camille. Kelli and I both LOVE the fabric line. The quilting is done with Maxi-Lock Swirl – Variegated Thread 3,000 yds – #61 Peachy Orange Parfait . The light yellow was soft like the sashing and the oranges looked good with the orange of the fabric. I was very happy with the choice. The backing fabric I had. The colors of the over sized polka dots matches the colors on the front. For the backing the thread was just a white thread that I had here. You’ll notice that the background fabrics of the blocks are all the same color family but the prints are all different. We loved the solids in the line and wanted to make them shine. I wanted a whimsical quilting design to match the whimsical backgrounds so I did some custom work. The sashing was just a wave with an over sized swirl at the cornerstones. Mine is far from perfect but it was fun and I am all the way over trying to be perfect. The back ground just had a small stipple in it. 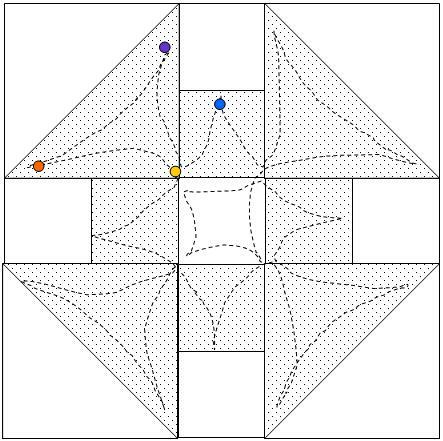 I know I get stuck with coming up with an idea on how to quilt something so I thought I’d share this idea as it does look great for Turn Dash blocks. The FREE pattern for this quilt is available here. This entry was posted in Finished Projects on October 4, 2013 by Jo. 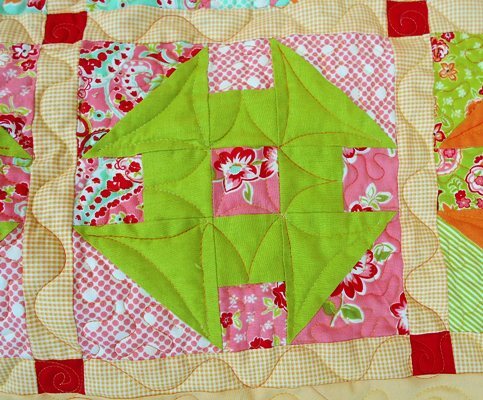 Thanks for sharing the quilting design. I prefer no-mark! Love the fabric combination. Really lively colours! They look a riot of fun all together. Very pretty and I love those colors together!! Love it …so cute and so fun…..
OMG – am loving those colours sooo much. 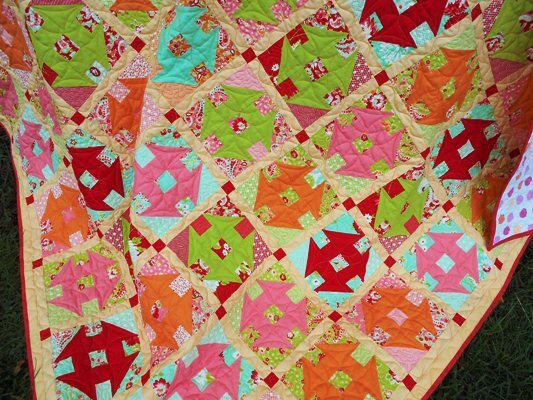 What a fun, funky, cheerful quilt!!! Visiting from “Finish it up Friday”. LOVE leftovers — gorgeous colors! Such a joyful quilt! Great use for using up leftovers. You have my gears moving as I have some triangles from a finished quilt. Scrumptious is such nice line! and now each time a comment is added I get four e-mails wiuth the same comment. Is there any way you caan remove people from that service? Thawnk you! This is great and the yellow totally does work! I am not sure how I wasn’t following you already, but I fixed that immediately! Great quilt!